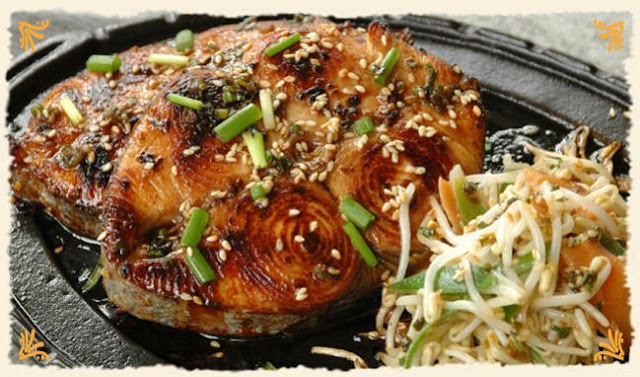 A simple Korean-style seafood dish with ginger,sesame seeds and Mama sita's Barbecue marinade. Chicken can be used instead of fish. Served on top of steamed rice. 1. Combine spring onions, Mama Sita's Barbecue Marinade, and sesame oil. Marinate tanigue in this mixture for 10 minutes. 2. Heat some oil in a skillet or flat frying pan. Fry tanigue steaks taking care not to overcrowd the pan. 3. Combine all ingredients for the sauce, heat for a minute and drizzle over the tanigue steaks. Garnish with toasted sesame seeds and chopped spring onions.